File Photo of Frank Edwards. San Pedro Police are reporting that there was a shooting incident between members of the Belize Coast Guard and civilians. The incident occurred on Saturday, November 16th, on northern Ambergris Caye and resulted in one person shot. According to San Pedro Police, Belize Coast Guard Lieutenant Gregory Soberanis visited the San Pedro Police Station and reported that a team of Coast Guard officials went on a boat operation just South of Mexico’s Border sometime around 7:30 AM. Upon reaching the old Fisheries Department base on the north-eastern side of the island, they saw six males one of whom was a distinguished by his dread locks) who, upon seeing them, opened fire at the Coast Guard vessel. The Coast Guard team, returned fire injuring a male person. 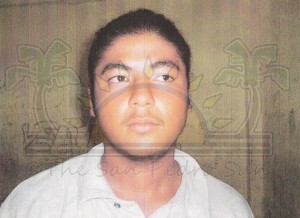 That person was identified as 24-year-old Frank Edwards, a Belizean fisherman of San Mateo area of San Pedro Town. Also captured were two males, 20-year-old Leonard Williams, a Belizean fisherman, and 22-year-old Guillermo Salazar, a Belizean fisherman, both of San Mateo area of San Pedro Town. According to police, the other two males, including the gunman, made good their escape. A search within the area of their camp lead the Coast Guard Officials to a black knapsack which containined 270 grams of suspected cannabis. All three persons were taken to the Dr. Otto Rodriguez PolyClinic II. Edwards was seen with injuries to his left hip and buttocks from what appeared to be a single gun-shot wound. Edwards was transported to Belize City to seek further medical attention. Williams received injuries to his forehead and a medical officer his certified his injuries as wounding. Salazar was seen with a swollen jaw on the left side of his face and a medical officer certified his injuries as Harm. Edwards remain under police guard, while Salazar and Williams remain detained at the San Pedro Police Station as part of the investigation.